Forrester Research has revised its 2009 technology spending projections with expectations that U.S. IT spending will fall 5.1 percent in 2009 with global outlays to drop 11 percent. The deeper decline is due to the deeper US recession, with the June 2009 consensus of forecasts for 2009 US real GDP growth shifting down to -2.8% from the March 2009 consensus of -2.2%. However, the bigger factor is the big drops in business investment generally — and IT investment in particular — in Q1 2009, which is also likely for Q2 2009. The good news: Forrester reckons that IT spending will bottom in the third quarter. Companies large and small have been shut out of credit markets; even those that still have access to bank loans, markets for commercial paper, or corporate bonds often have had to pay much higher interest rates. US businesses have been hoarding cash and cutting capital investment, with IT capital investment getting caught in the pullback. To appreciate the importance of the credit crunch, contrast the experience of the Canadian IT market with that of the US in the same period. Like the US, Canada is suffering from a bad recession. However, its financial system is much healthier, and its businesses as a result have not cut back on their IT investment. The result? While US business investment in IT equipment and software fell by 13.5% in Q1 2009 from the year before, Canadian business investment in IT was flat. Forrester, like many other economists, is betting on a second half rebound—-or at least slower declines in the economy. 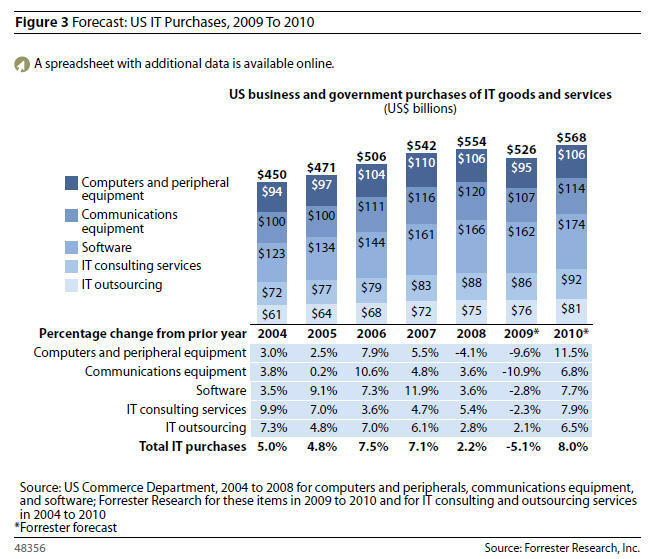 And IT services and outsourcing will decline 8.6 percent in 2009 with a 4 percent gain in 2010. The weaker global picture is due to currency fluctuations (a weak dollar) and gross domestic product revisions in industrial countries.